I just wanted to let everyone know that I did not in fact fall of the face of the Earth! I just want to let everyone know that I am OK and nothing is wrong! :) I have gotten lots of emails and messages about my whereabouts. You are all so supportive and I appreciate your concern. I will still be hosting giveaways of the remaning four items. 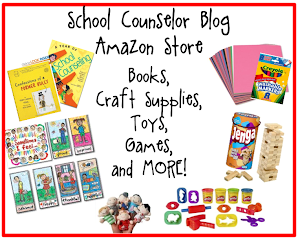 I don't have a specific date set for the giveaways at this time, but I will announce the giveaways through School Counselor Blog, the School Counselor Blog Facebook Page, Twitter, Pinterest, and Google+. I actually have one giveaway going on right now. 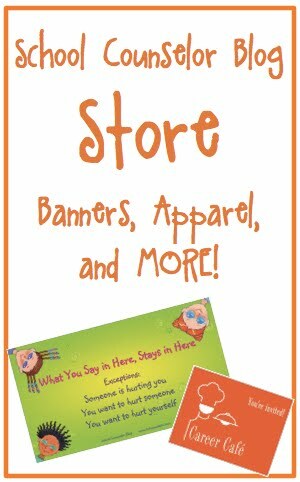 Head over to the School Counselor Blog Facebook Page to enter to win a FREE BANNER OF YOUR CHOICE from the School Counselor Blog Store. 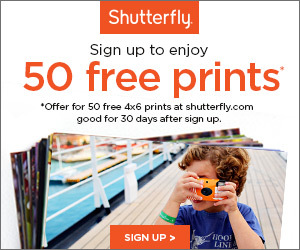 :) You have until Sunday, September 16th at 12:01am EST to enter! Starting my Ph.D. program has been a much bigger adjustment for me than I anticipated. It was especially hard to get back in the swing of things after having off all summer! I am still trying to get used to things and get my bearings. There have been many times already that I have thought and even pondered aloud "WHAT DID I GET MYSELF INTO?!" I have to keep reminding myself that I am on a journey towards a destination that I have wanted for as long as I can remember. That being said I am absolutely LOVING my graduate assisantship where I work for the student services program for the Department of Athletics. Of all of the jobs I have had in my life I have never felt so welcomed, appreciated, and respected. Ever. It has been pretty great to say the very least. I am very excited to host programs to support the academic success of student athletes. I love creating and planning programs (as you may know) so I am dying to get started! 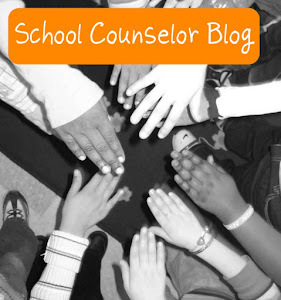 I really want to make the programs I facilitate student-focused. 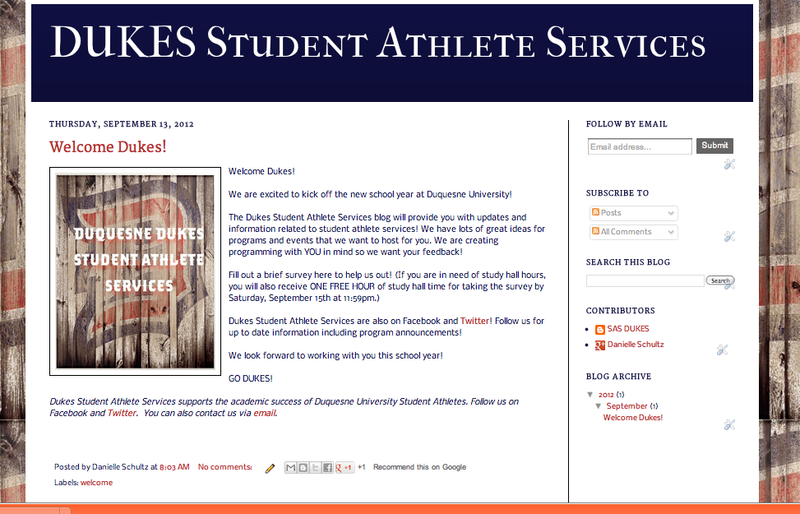 I first met with an officer in the student-athlete organization to get feedback on the ideas I am hoping to implement. The student athlete officer was very interested in the ideas I had and also offered great additional suggestions. After talking to the student officer, I created a survey using Google forms to administer to students. I am using the survey to see which programs students are interested in and when they would be available to attend programs. I will be attending a meeting this weekend to share some of my ideas with the student athlete organization as a whole and get suggestions and feedback from the group. Just from the talking to the student-athlete officer and receiving initial results from the survey, there is a lot of interest in the different types of programs I plan to offer. 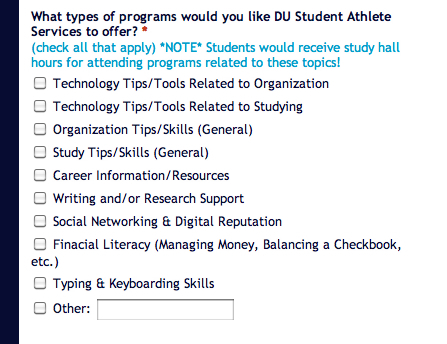 Below is the question I asked students about programs they would like to see offered. 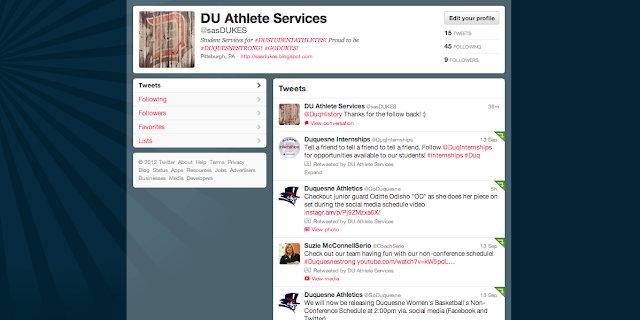 I created a Facebook page, twitter account, and blog to share information with student athletes. I think this will be a great way to connect with them and will make information easily accessible. I will be sharing tips and information related to academic success as well as the other areas that I plan to facilitate programs about. I am very excited to start programs and share more information with you all about the specifics of the programs. So... how has your school year been so far? What have you been up to? Please share your questions, comments, and feedback in the comment section below! I would love to hear from you!